Cadillac, a leading automotive company, said its race engines have secured 11 of the first 15 podium places — including all five victories - in its first year at the 2017 IMSA WeatherTech SportsCar Championship. The Cadillac 6.2L V-8 engine has been consistent in delivering power and reliability to the three Cadillac prototype race cars: No. 10 Konica Minolta Cadillac DPi-V.R, No. 5 Mustang Sampling Cadillac DPi-V.R and No. 31 Whelen Engineering Cadillac DPi-V.R, said a statement from the company. Each team has only used two engines in competition, enabling the newest generation of Cadillac race cars to collectively cover more than 15,500 miles under IMSA sanction with near-flawless performance, it added. The race-prepped Cadillac 6.2L V-8 engine, which shares inherent architecture with the Cadillac 6.2L V-8 engines in the Cadillac CTS-V super sedan and the Cadillac Escalade prestige SUV, is naturally aspirated and outputs near 600 hp at a maximum allowable 7,600 rpm with the series-mandated air restrictors in place. The race car engines are modified, built and maintained by ECR Engines, said the statement. 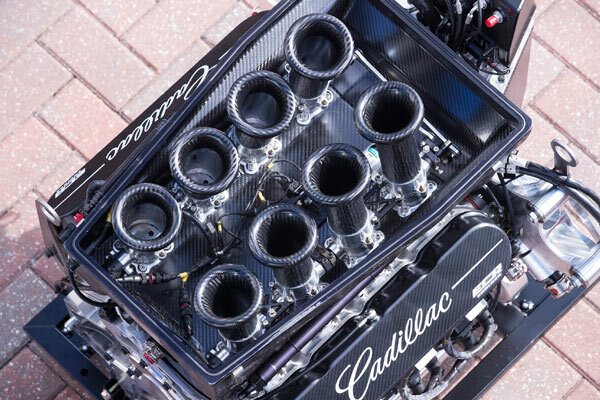 In addition to providing lasting power, the Cadillac 6.2L V-8 is an integral part of the overall design of the Cadillac DPi-V.R prototype race car, and a key to the structural rigidity of the car. As a semi-stressed member of the chassis, the engine takes some of the load delivered from the chassis, acting as the spine for the carbon fiber monocoque, it said. This design feature was on display during the 12-hour race at Sebring International Raceway, 3.74 miles of varied surface including cement that has survived since being used as a World War II runway. The pounding that a race car takes during the 12 Hours of Sebring is equivalent to what a race car endures during the 24 Hours of Le Mans. In addition, the engine has to withstand the high-sweeping loads of Daytona’s banked speedway, the high lateral g-forces at Circuit of the Americas and the bumpy rides of the Long Beach and Detroit street courses with their surface changes, crowns and curbs, it added. “This season we exchanged engines only once for each car, each receiving a fresh engine after the Rolex 24 At Daytona. We disassembled the first engines and found no issues, problems or anomalies after the Rolex 24,” he said.